Over at Marie's: Catching Up, Easter and my 35th Birthday! Catching Up, Easter and my 35th Birthday! We're well into the month of April, my sister had her third baby last week (SO EXCITED! ), my kids' birthdays are right around the corner and although the weather has made me curse the sky (on more than one occasion), it looks as though we may finally, FINALLY thaw out up here in the mitten later next week. Am I the only one who thinks it's nuts that Easter is behind us? It came and it went...in a flash! 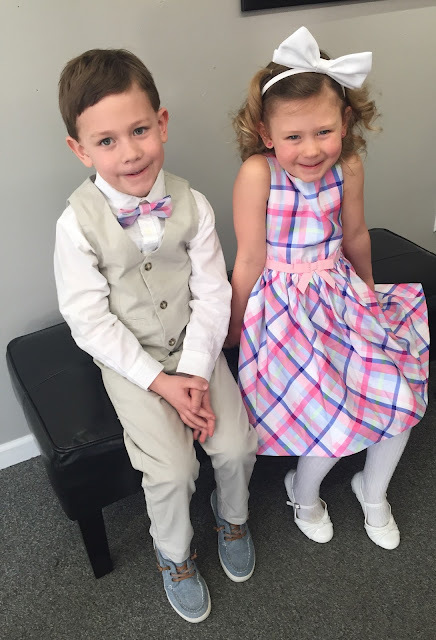 I had scheduled the kids' Easter pictures a couple weeks in advance but I never had time to pick out coordinating outfits for them this year. So, two days before their pictures, I drove to "The Outlets" and decided on the way that I'd go into Gymboree and pick out the cutest coordinating outfits from top to bottom then and there. Lucky for me, my plan worked (although we did have to walk next door to find shoes for Eliza). Phew. A few days before Easter I decided Eliza and I should bake some homemade chocolate chip cookies. It was so much fun. Henry and I used to bake together all the time and I'd say it's about time Eliza and I spend more time in the kitchen together. Henry finished up his school's, "March is Reading Month," with what he'd like to be when he grows up and I'm happy to announce that, for the second year in the row, he dressed up as a teacher! At one point in March my interior decorating juices were a-flowin'. You guys - look at this! It's contact paper from the dollar store!!! Yup, I put it up on the wall and I'm sort of digging it. I'm thinking I'll add a bit more on top and call it a day. This little transformation may constitute its very own blog post. What do you think of it so far? I mean, I'll add more up on top there if I decide to keep it. But seriously - Am I crazy?! At one point, we headed to grab some ice cream and I had to laugh as I looked at what I was wearing; I was sporting my favorite rain boots (it wasn't raining), pajama pants (it wasn't bedtime) and my fav fleece lined hoodie (because winter won't go away). I won't show my face. It wasn't good you guys, it. wasn't. good. We got dressed and took Henry and Eliza to breakfast. We rode the train to the next town over. Upon arrival, all of the kids circled around the park and patiently waited for the egg hunt to begin. Once the countdown ended all the kids started to collect eggs, but unfortunately Eliza instantly became overwhelmed (aaaaanddd....she started crying....apparently we're in the cry-about-every-little-thing phase of childhood). I guess we should've told her that it may be a bit intense. Oops! Eliza felt even worse when Henry came over to show off all of his eggs he had collected. Girlfriend literally had three eggs that Jon and I had picked up for her......whhhhhiiiich resulted in more tears. Luckily a little boy from Henry's class came over and gave Eliza one of his eggs. The Easter Bunny made everything better! On Saturday we just hung out at the house, we eventually went into town for coffee, drove around for a little bit to find home exterior inspiration and then we prepared for the U of M Final Four game, but before the big game, we made sure to dye Easter eggs! Michigan beat Loyola and we were ecstatic! Unfortunately, if you follow college basketball, you know the outcome. After the game, the Easter Bunny showed up and left the kids' Easter baskets! Oh and guess what?! As the clock struck midnight, I turned 35. Normally I'm pretty excited for my birthday and I'm all, "Yay! I'm alive! Life," but this time around I did a lot of thinking about what I've done with my life thus far. You guys, I had a mini-mid-life crisis at least once a day for about two weeks leading up to my birthday. Also, I'm not actually crying here. I'm just making a "blah" face and I was reaaaaaally tired... Honestly, I think I just look this tired all the time now. Because 35. *facepalm* NOOOOOOOOO!!!!! These little faces made the next morning so much better! Jon actually bought me a card this year! Major points here. Apparently I'm extremely easy to please. He probably could've just stopped with the card, but he also ended up buying me a knew iPhone, as well! What-what! We played with the kids for a bit, Jon made some calls to get my phone up and running, we ate some breakfast and then got ourselves together and headed up the road to our hometowns to visits both sets of parents. 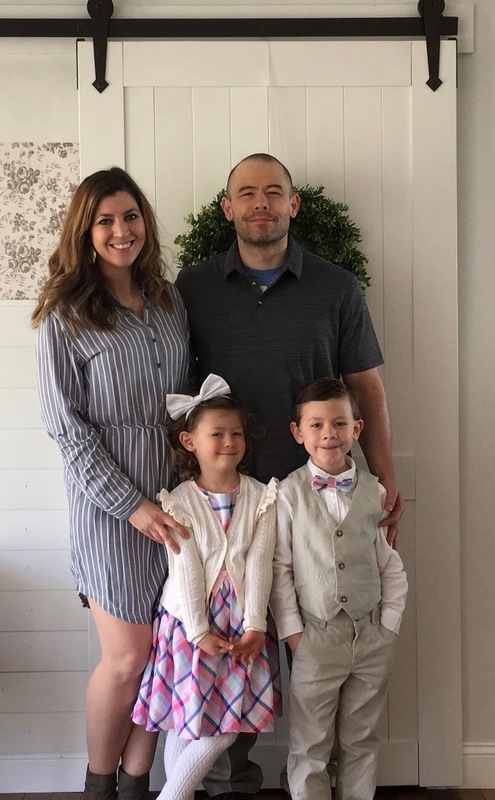 We haven't been back for Easter for many years, so it was exciting to see family on an actual holiday! My father-in-law did not disappoint. Look at this drink he handed me within minutes of arriving! The kids were given juice with fun light up ice cubes (just like the ones we had with Grandma and Grandpa in Disney)! My in-laws spoiled me with some awesome birthday gifts (my sis-in-law also bought me a Tervis U of M wine glass)! Oh my gosh - and they sang Happy Birthday to me and my nephew, Gryffin! After visiting with Jon's side of the family, we drove over to my parents' house. My mom and dad gave me a bit-o-cash for my birthday, my sister had previously sent me a package from Magnolia Market and they also sang Happy Birthday to me...and we had cake! WooHoo!!! I can't remember the last time hearing my family on either side sing Happy Birthday to me! I loved it! We were able to eat, visit and relax for a good long while before having to pack up to leave. After the two hour trip back, we arrived home around 9:30 on Easter Sunday. It was a long day, but totally worth it! Now bring on spring...and baby snuggles...lots and lots and lots of baby snuggles! Linking up with Hello Monday!